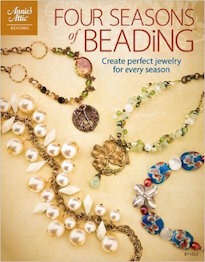 Do beads and jewelry making components ever take you on a trip down memory lane? Lisa shares a song inspired by sparkle. Make a cutie patootie little bunny charm bracelet. Erin takes us through this month's inspiring challenge entries! Cyndi has her March pieces completed for the Bead Journal Project, and they feature an embroidered form of the Cellini spiral! Resin Crafts has a week of how-to's featuring Nunn Design and a great giveaway for the winter Nunn Design collection. 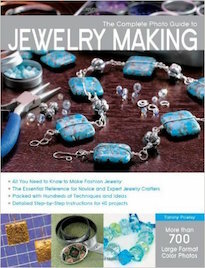 Jean discovered a great offer from Jewelry Making Daily and wants to share it with her readers! Using Now That's a Jig!, Andrew creates a fun ring! Necklace, bracelet, earrings. The last real prompt for the Fusion Beads 30 Day Bead Challenge was to create a matching set of jewelry. 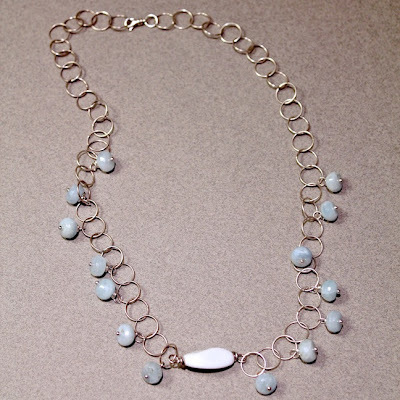 I decided to utilize some large-link silver chain, faceted aquamarine rondelles and white vintage German glass. I love how light and airy the chain is and how the dangles are playful and add a sense of whimsy. The colors are cool and refreshing. Normally I prefer larger clasps, but I am a smitten kitten with the swivel lobster clasps and I think they function perfectly. I think that they form a unified set. I don't make a lot of matching jewelry, but I liked thinking about the elements that I liked and wanted to reappear in each incarnation. Some things carry throughout the three different pieces, like the colors and the metal. To see a list of all of the challenge to celebrate National Craft Month, CLICK HERE. 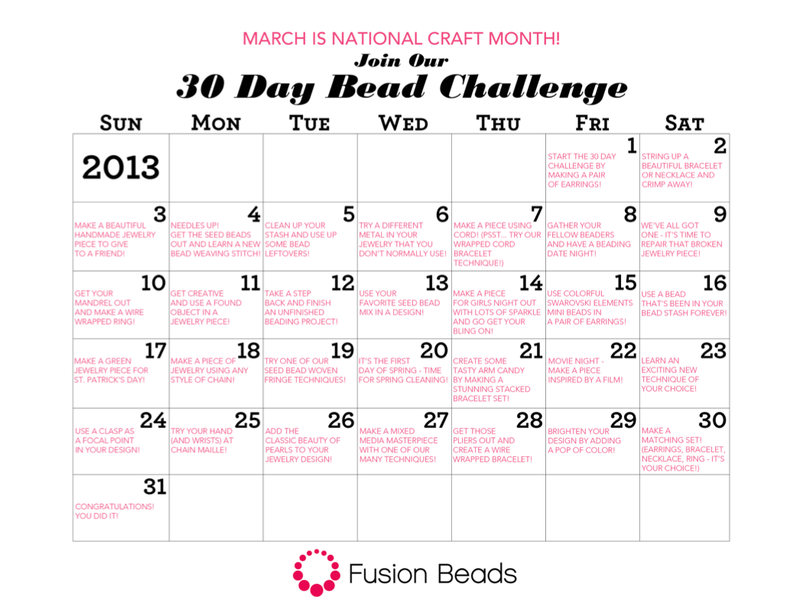 We're coming closer to the completion of the Fusion Beads 30 Day Bead Challenge. For Day 29, our prompt was to add a POP of color to a design. I decided that I would brighten up the design with the vibrant red of a coral disc. 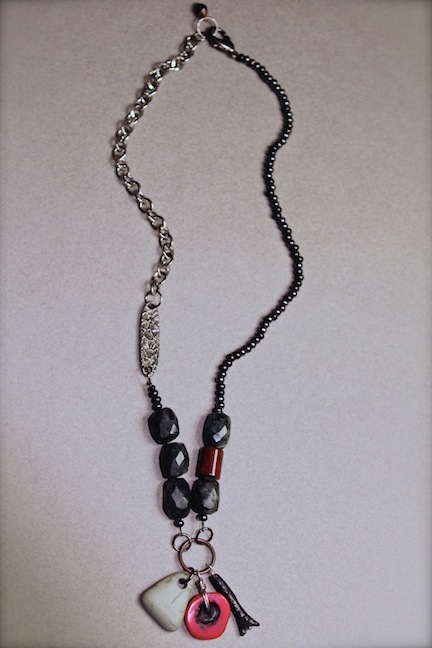 I used this piece amongst a gray river-stone, vintage black ceramic, faceted tourmalated quartz, silver chain, a fine pewter link from my family at Green Girl Studios, gunmetal seed beads, and a jet Swarovski crystal. I thought that this asymmetrical piece needed a little bit more visual balance, so I cheated a little bit and added a red jasper barrel bead. It's not so red that it takes away from the POP of the coral disc. There's only one more challenge left. To see all of the prompts over the month, CLICK HERE. I've been busily working away on various projects in the background. I've been challenging myself creatively all month long and it has opened the floodgates. All kinds of ideas have been pouring forth and I have been very productive. These cuffs are just a few of the things I've been working on. The bracelets are composed of layered copper sheet metal that have been riveted together. The base layer was flame polished and the upper layer was etched and colored. Each bracelet has a different focal. In this picture, (starting at the bottom) there's a fine silver and ceramic rake disc from MAKUstudio, in the middle there's a lampwork glass disc from Stephanie Ann, and at the top there's a speckled black glass disc from Joanne Zekowski of Z Designs in Glass. Before I was interested in jewelry, my background was in fine arts. I was always interested in the mirroring forms of the microcosm and the macrocosm. I did a body of work that blended cellular mutations (like cancer) with modern day cartography. I also used to do etchings. In making these cuffs, I decided to rattle the bones and bring up ghosts of projects past. I drew on the copper sheeting, in a similar style to the work I used to make. I then etched the surface of the copper. This is a different process than the one I did in college. Back then, we covered the backs in a substance called asphaltum varnish, coat the fronts in a melted wax, and then use a stylus to inscribe the wax. Where ever we removed the material, the acid would eat away the metal. Once it was dipped in acid, they were cleaned and inked up and ready for printing. But instead of using the plates as a vehicle to transfer images, I used this one as the image. After the plate was etched, I cut it into stripes, filed the edges on the pieces and then flame polished them. Flame polishing doesn't create a stable colorant. It can be worn off or can darken. To sort of stabilize the color, I sealed it with a spray fixative. The cool iridescence and trippy metallics are lost, but some of the colors remain and are subdued from their original technicolor brilliance. I then went back over the strips with Guilder's Paste to accentuate the colors. Once the decorative strips were finished, I assembled the cuffs. 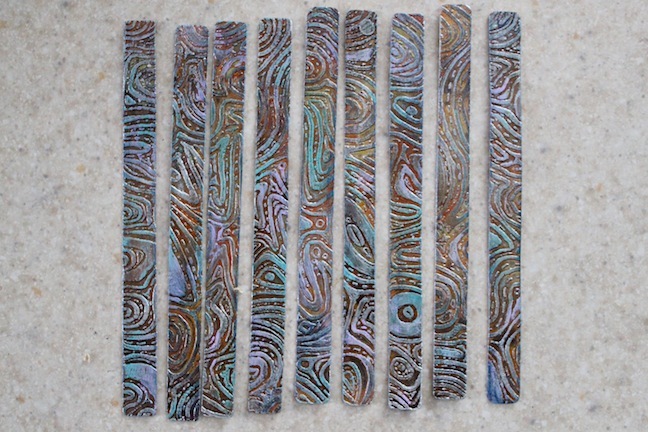 After etching, the strips alone could not be formed into bracelets. They needed a backing to provide extra strength and frame the little pieces of art. Some days I wish I could pluck out my heart and replace it with a succulent. They're sturdy. They can survive even the most extreme environments. Where other plants would surely perish, they thrive. Their leaves are luscious and full, when others are crispy wisps. And should something attack, they are equipped with spikes and barbs to protect themselves. If they are broken, they multiply happily and fruitfully. Some days I wish I could replace my heart with a succulent. The past few days... weeks... have been a challenge. I make an effort to have a brighter disposition. But some days are harder than others. In the midst of all this, I received a lovely email. The message was simple: Focus on love. 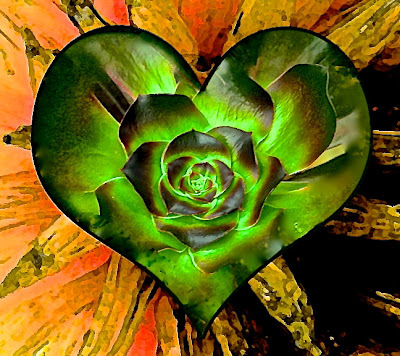 I may not be able to reach within my chest to replace it with a desert plant, but I can redirect my energies and feelings towards love. Love is my armor. Love is my defense. It protects me against harm and hurt, even when it comes from a close source. These challenges only make us stronger. Love is my talisman. The prompt for Day 28 of the Fusion Beads 30 Day Bead Challenge was to create a wire-wrapped bracelet. I used a combination of copper wire and bronze wire to create this embellished bangle. I used the Now That's a Jig! bangle puck to shape the base of the bracelet. To dress it up, I created wire-wrapped dangles strung with amber, Swarovski crystals, and yellow opal. The dangles give the piece nice movement and a little playfulness. The dangles flank the focal of the bracelet. The focal is a large copper-colored, Cosmic-cut, Swarovski crystal. The back of the bangle is micro-wrapped with faceted Hessonite garnets. I love the way that they stud the bracelet. I think I might make a few bangles that are entirely wrapped in this fashion. The month is almost up, but you can still download one of the calendars by CLICKING HERE. Tammy Powley is hosting a giveaway! Up for grabs is a stylish tote bag from Thirty-One. The deadline is April 19th. She is also running a deal in her independent consultant website. If you spend $31 or more, you can get a selected bag for half off. This promotion ends April 1st. To find out more on how you can win and the details of the special, CLICK HERE. I'm sure that there's an easier way to make this cuff bracelet that I made for the Day 27 prompt of the Fusion Beads 30 Day Bead Challenge. Our task was to make a "mixed media masterpiece" and it took some figuring to get it just right. I had the idea that I would make the base of this bracelet as a framework of hammered copper that I would sandwich strips of vintage kimono fabric in. It slipped my mind that the outer frame would become "shorter" than the inner one as I bent the metal. It became apparent when I popped the rivets on one side of the cuff. Eventually I got the measurements right and re-riveted the piece to hold it together properly. I embellished the cuff with a pendant that I made from filigree, a bezel and a vintage stamp covered in resin. I held it (and a wire-wrapped dangle with a gold-plated fine pewter daisy spacer, an enameled bead and headpin) in place with a piece of vintage sari silk ribbon. I like the idea of tying components on with ribbon. Not only does it add a pop of color, but it can also be easily changed out for new colors or different textures. If you'd like to see the prompts for the month-long challenge, CLICK HERE. Even though we're rounding the final stretch, you can always start whenever you like. It's a worthwhile endeavor and has truly inspirational! 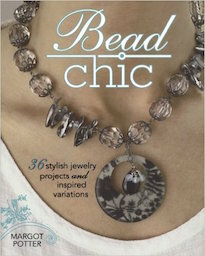 The challenge for Day 26 of Fusion Beads' celebration of National Craft Month was to use pearls in a design. The focal is a bezel from Susan Lenart Kazmer that's been filled with two-part epoxy clay and studded with wire-wrapped pearls. 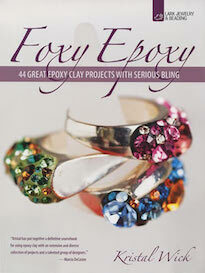 I used a technique similar to this in Kristal Wick's new forthcoming book, "Foxy Epoxy " for one of the ring projects. I used a white clay and dusted it with powdered mica dust to give it a pearlescent feel. Around the focal, I put some small biwa pearls and vintage glass seed beads on wire-wrapped dangles. From that extends a variety of freshwater pearls and glass pearls to complete the bracelet. 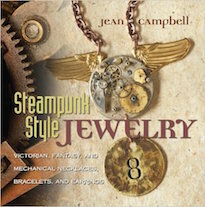 To bring it all together, I used a sterling silver toggle from my family at Green Girl Studios. I'm really pleased with the way this turned out. I think the balled headpins match the feel of the studding on the sides of bezel. I also think that the cool tone of silver in the toggle and the bezel go nicely with the pearls. I think it has a very expensive look to it. To see this and other challenges on the calendar, CLICK HERE. This is the view from my porch this morning. It snowed the night before, covering everything in the powdery white stuff. Things should be coming to life and blooming explosively. Instead, everything is whitewashed with cold. The snow is pretty, but it comes at a cost. I'm not just talking about the wet socks and extra high heating bill. As a small business owner in a tourist town, excessive snow days can mean death. That sounds rather dramatic, but the reality is that we walk a very fine line in this economy. While we generally do well for a small shop, one bad thing could turn the tide. We are growing our online store, but while it takes root, we definitely rely upon our physical location to make the numbers we need to stay afloat. The snow acts as a deterrent. I'm tired of the cold. I'm tired of worrying if things will pick up. I'm sick of having to sweep sidewalks and scrape windshields. I just want the sun to come out and melt all these troublesome concerns and anxieties away. I've set the Now That's a Jig! up in the store and whenever I have a free moment, I take my roll of wire and head over to the makeshift station. I've been having a wonderful time exploring the different applications and just playing with wire. I've been really inspired lately and have been making all kinds of things. Today I made this ring. I love making rings on Now that's a Jig!, because one of the pegs fits my index finger perfectly. This ring is fairly simple, but I love how the focal can be switched out. It holds anything round, from beads to marbles. The picture features one of my enameled beads. I flailed about, flinging my hands around and the bead did not pop out. It held on nicely. I'm really happy with the way this turned out! Fusion Beads' celebration of National Craft Month is well underway. For the Day 25 challenge, we were asked to incorporate chain maille into a design. I busted out Anne Mitchell's, "Chain Making Techniques" to help me in this endeavor. While I use some chain maille techniques, I stick to the basics and use them sparingly. This design is called, "Augmented X". I dressed my version up by using a mix of shiny bronze jump rings and sterling silver ones. To pull it together, I used a toggle from Nina Designs. Missed most of the fun? You can still creatively challenge yourself. 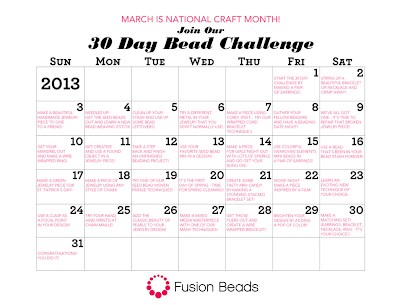 The Fusion Beads 30 Day Bead Challenge is something that can be done any time! CLICK HERE to download a calendar. 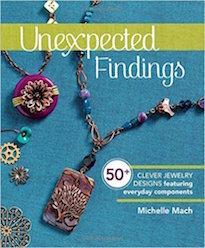 Do you get excited over a particular bead or pendant? You are not alone! 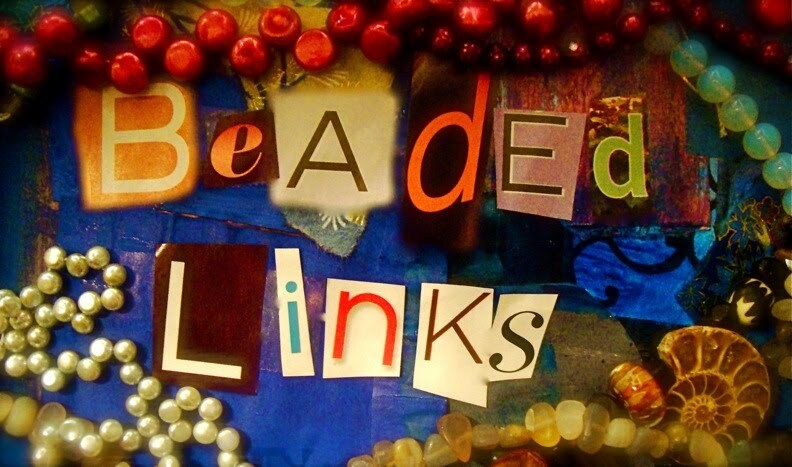 Stop by A Bead A Day to help Lisa with a design for her pendant. 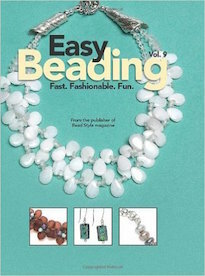 Tammy takes another look at Jewelry Stringing magazine. Brandi pulls out some delicious colour palettes from some of ChelleV2's beautiful handmade ceramic beads. Cyndi has some process shots from a bead embroidered necklace that she made looooong ago, and never got around to sharing before! Making a mold and then working with the duplicated item can create stunning new wearable art! 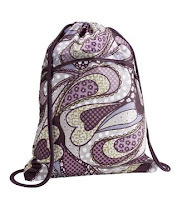 Tammy Powley has a super giveaway going on on her blog! Read all about it on Jean's! Andrew started a book club... with a twist! "Inspired by Reading Book Club" is a fun, interactive way to explore literature and create! I feel a little bit like I'm going through my own internal spring. My creativity is budding. I've been having the most wonderful work sessions and keep thinking up ideas and dreaming up creations. A lot of what I want to do is still in the works. I'm in that in-between stage where things are all coiled up and bound together tightly... just waiting to explode into a riot of color! One of the things that I've been working on that has been extremely helpful is letting go of preciousness. I had a collage teacher in art school named, Victoria Kann, who once said, "sometimes you've got to murder your darlings". It was a profound moment that I have to remind myself of. I have a lot of beautiful components that on their own are art pieces. I could happily look at them in little bowls and piles and be amazed at their beauty... but sometimes you've got to let go of the preciousness and take a risk that you might fully destroy what you're working with in order to achieve something sublime. The rewards can be much greater if you're prepared in your heart to let go. You won't see a miracle unless you're willing to sacrifice the things you love most at the altar of creativity. It's like Abraham's binding of Isaac in the Bible. You have to have faith, belief and trust. With that being said, I dusted off some beautiful peridot and created this cuff bracelet with hammered copper and rivets. I love it. The peridots studding the bracelet have such a striking color and contrast beautifully with the subtle pink cast of the worked copper. I was hoarding these stones and didn't want to use them. If I hadn't, this bracelet that I'm so pleased with would not exist. I lost two stones in the making of this piece. Once, I hit the rivet too hard and cracked the stone, and the other one was broken when I tried to ream the hole out a little larger. Small prices to pay, for satisfaction. Working with a clasp as a focal was the challenge for Day 24 of the Fusion Beads 30 Day Bead Challenge. I used a bronze large flower clasp from my family at Green Girl Studios. I thought that the warmth of the clasp went well with the luscious green pearls and faceted Czech glass rondelles. I like the versatility of this piece. The flower clasp can be worn in the front OR it can worn in the back or off to the side. There's not much time left to participate, but you can still download one of the calendars! Just CLICK HERE. 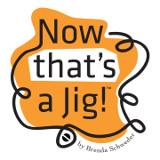 I've been having a blast working with the Now that's a Jig! It's kind of like doodling in 3D. I wanted to make something that was a little different and really stood out. With the wire, I created these inverted teardrop shapes. As I was forming the feather-like plumes, I noticed how easy it would be to make a ring! So I made one out of copper wire. I used bronze wire as an accent to the copper wire and I wired on rounds in glass and vintage plastic. The ring I made stands up pretty tall. It reminds me of a cathedral with stained glass or a bunch of stylized feathers. Working with the jig is a lot of fun and the ring is definitely a conversation starter. I once observed a herringbone stitch class that had painfully derailed. The teacher was talented and capable, but the chemistry just wasn't there and things didn't click. I kept seeing beautiful things made with herringbone stitch and heard all kinds of wonderful things, but after seeing the class go awry, I was a little put off by it. The prompt for Day 23 of the Fusion Beads 30 Day Bead Challenge was to learn a new technique. I decided to finally try my hand at herringbone stitch and started a bracelet. It wasn't as hard as I thought it'd be and can't wait to finish this piece. If you'd like to participate in the celebration of National Craft Month, it's not too late! CLICK HERE to get a calendar of challenges. The challenge for today was to create a piece inspired by a movie. I deiced to pick Penelope. I enameled the flowers, making them look like hellebores and wire-wrapped the garnets. It's strung on a cluster of chain. The movie has a lot of purples and greens with pops of red. Here's a close-up of the enameled components and the wire wrapped dangles. It has fantastic movement and the flowers hang down, like real life hellebores! It's not too late to participate! CLICK HERE to get the calendar! I've been having a wonderful time playing around with the Now that's a Jig! This tool, developed by Brenda Schweder, is a great resource for creating consistent wire components. She has a bunch of FREE projects available for download. Just CLICK HERE and scroll down the page. When I was in art school, one of the assignments was to set up a still life and render it using different mediums and techniques. It was a great way to really see the subject and explore its nuances through the different materials and methods. I decided to give myself a little challenge. Using the Now that's a Jig!, I created a triple-loop-helix shape out of 18 gauge copper wire as an earring component. This was going to be the base to work from and investigate variations on a theme. For the first variation, I embellished the earring components with wire-wrapped dangles strung up with Swarovski crystals. I picked two shades of pink. When copper is annealed and quenched quickly, it creates a beautiful rosy color. I wanted the crystals to mimic this lovely hue. I used the darkly patinated balled headpins to give the piece a little more contrast and definition. For the second variation, I was inspired by ancient Egyptian jewelry. I filled in the loops with translucent polymer clay and did some washes of acrylic paint over the individual cells. I also touched up the copper wire with Testor's enamel paints to make them more gold. In the light, they seem to glow like fiery carnelians in the desert sunlight. For the third variation, I wanted to keep it simple and elegant. I decided to incorporate two different colors and sizes of coin pearls. I wanted to showcase the looped shape of the wire component, by using it to frame the beads. The bronze wire and gold-filled earwires provide a subtle accent. For the fourth variation, I wanted to create something reminiscent of the earrings that I made that just won the Nina Design Blog Partner Earring Design Challenge. I love how the wired on stones seem to give the earrings a luxurious, almost regal, feel. Instead of using the rough, more organic, pyrite nuggets, I used faceted nuggets with a rose-gold colored coating. The warmer color seems to bridge the bronze and copper. As the focal, I incorporated solar quartz briollettes. For the fifth and final variation, I wanted to go for a more tribal and earthy feel. To the base copper shape, I added copper-colored ancient coin replica charms and patinated bronze sunburst discs. The round shapes mirror the form of the base components. The earrings have a lot of movement and have an organic feel to them. 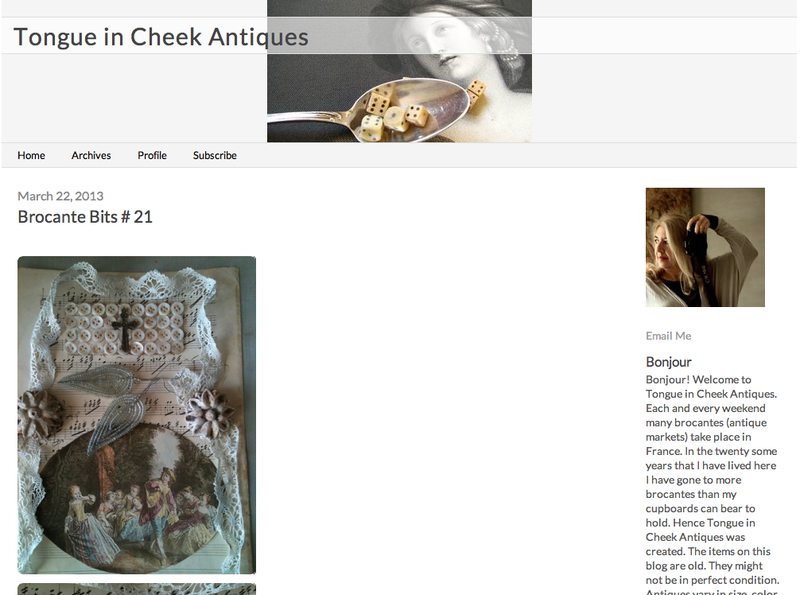 Thanks Kathy Dorfer for suggesting Tongue In Cheek Antiques! 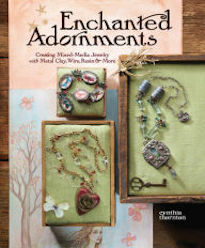 It's loaded with French flea market finds that are wonderfully inspirational for the Inspired by Reading book. AND some of the pieces are for sale! CLICK HERE to peruse this blog of treasures. I think that this week has been one of the most productive so far in the Fusion Beads 30 Day Bead Challenge! I've gotten a lot done, but I also have been really inspired by the prompts and have been working double-time to work on all these new ideas. Maybe it's the start of spring or some alignment of the planets, but I'm starting to feel more energized and as a result, getting more stuff done. There's still ten more days left of this month-long celebration of National Craft Month. It's not too late to participate! CLICK HERE to get your calendar.